When Brett and Susan Sommers of Figpickels Toy Emporium in Coeur d'Alene, Idaho won TDmonthly's Charity Giveaway contest for the second time, they knew they had to do something different to attract the attention of their local press. They'd been covered by several newspaper articles through the holidays of 2012 on into the New Year. Their second win might be considered anticlimatic...but Brett and Susan realized they could amplify their luck with creativity. 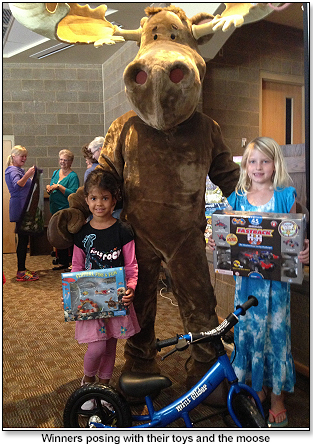 Instead of simply donating the toys from Safari Ltd., Glide Bikes and Infinitoys to their favorite children's charities as they did last time, they used the companies' generosity to create newsworthy fundraising events. The first, for the Juvenile Diabetes Research Foundation, was prompted by a local boy – Carson Magee – who is dedicated to helping the JDRF find a cure. Carson was diagnosed with Type 1 Diabetes in 2010, when he was just 7 years old. "Carson began a daily regimen of blood sugar checks, carb counting and insulin shots to keep him alive," stated Brett in a promotional flier. “With over 13,000 insulin shots and over 26,000 finger pokes deep enough to draw blood so far, his family prays for a cure everyday"
The Sommers encouraged their customers to purchase JDRF donation "sneakers" – which were hung in their front window. The sneakers represent the JDRF's walk to cure diabetes on September 22. Carson's walk team was called "Carson's Cruisers." Each person who purchased a Sneaker was entered to win one of two Toy Towers worth $500. 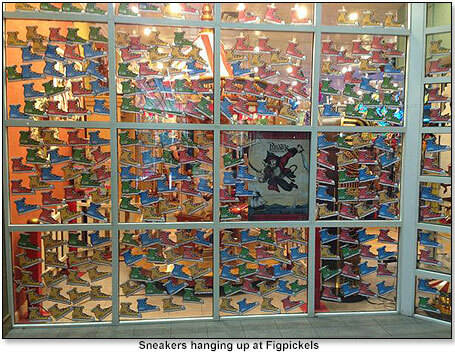 "Our store is just covered with these sneakers," Sommer told the Coeur D’Alene Post Falls – a local online paper at the time. Brett and Susan's customers purchased more than 800 sneakers in just a few weeks – "an astounding number," said Bret. "We ended up raising $2637.59 for the research foundation." The drawings took place on August 10th at 3pm. Carson’s mom, Fondra, also known as Bubbles the Clown, was among an array of entertainers, including jugglers, magicians, yo-yo champions, local celebrity Frank Peretti aka The Wild & Wacky Mr. Henry – and Carson himself, as Pockets the Clown. The September issue of Cour D'Alene Living Locals featured a 2-page spread on Carson's journey and the Figpickels event, complete with photos of Carson and his mom in clown regalia. The Kootenai Diabetes Endocrinology and JDRF had tables filled with educational material about Type 1 Diabetes and the work being done to find a cure. 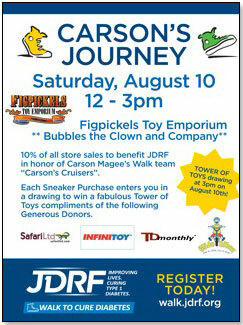 Figpickels donated 10 percent of their sales on Saturday to JDRF. 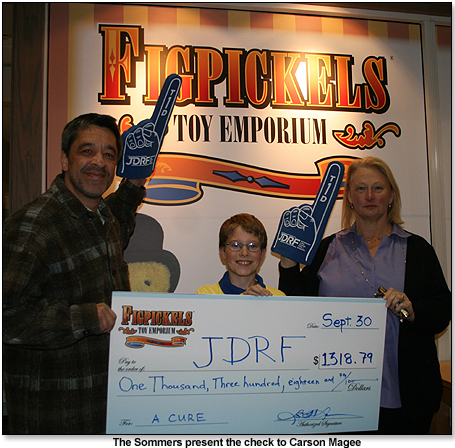 Figpickels raised $1318.79 for the JDRF - an amount that was matched by Tommy Hilfiger, bringing the total donation to $2637.59! 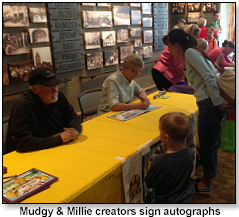 Brett and Susan also hosted a fifth birthday party for the children's book Mudgy and Millie, by local author Susan Nipp and published by their own Figpickels Press, which benefited their local library foundation. "The event was a really fun smashing hit," Brett told TDmonthly. 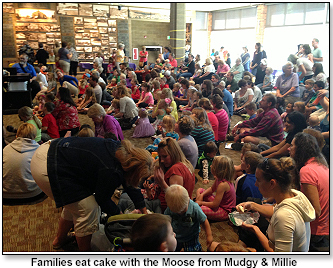 "Last year, the Coeur d'Alene public library was voted best in the state of Idaho." for the Coeur d'Alene Library Foundation, said Brett. 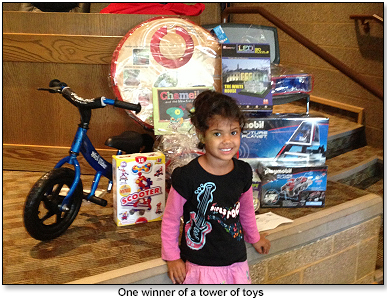 He and Susan set up two towers of donated toys that were given to two lucky attendees. 12" Mini Glider for children ages 2-5. Made from lightweight aluminum alloy, the Mini Glider features our patented slow speed geometry along with removable foot pegs, child sized handbrake, quick release seat post clamp, kickstand, and a lifetime warranty! Available in 5 metallic colors, weighs only 8 pounds. The ZOOB JR. Scooter features 18 ZOOB JR. pieces, 4 wheels, and instructions for 17 creations, such as a scooter, a mini go-cart, a skateboarder, and a spinning robot (but kids can make up lots more). The instructions require no reading, and are printed on sturdy cards. ZOOB JR. is our fastest-growing product category. Based on the success of last year's ZOOBMobile Fastback (which included one pull-back friction motor), the ZOOBMobile Fastback H2H features two pull-back friction motors so kids can create their own ZOOBMobiles and race them against each other. But kids can also put the motors together to make a super vehicle that goes even faster, for up to 40 feet. The Fastback H2H features 45 ZOOB pieces and 8 high-quality tires that are notched so they work like gears. Because ZOOB® pieces snap together so many different ways, kids can use their imaginations to create their own vehicles, and add on pieces from their ZOOB collections to make even more. The Fastback H2H is fully compatible with all other Infinitoy ZOOB pieces. Our keepers are more than just "cleaner-uppers". They show nurturing in action. Each replica is finely hand painted and accurate down to the last detail. Educational information in five languages is included with each replica. All our products are phthalate-free and thoroughly safety tested to safeguard your child's health. Safari Ltd.® takes pride in providing breathtaking, innovative and value priced figures for now over three generations. 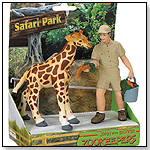 Featured is our Safari Ltd.® People John & Baxter Zookeeper Size: 1.5" L x 3.75" H (4 x 9.5 cm). Suggested age 3+. All of our products are lead free and thoroughly safety tested. Part of the stunning Incredible Creatures series, this Queen Triggerfish is a stunning example of nature in all its wonder. The product is soft to the touch for added realism and it floats. Finely hand painted, phthalate free and safety tested. Each comes with an educational hang tag in 5 languages. Size: 6" L x 4" H. View our entire collection at safariltd.com. Extra large, soft, playful, true-to-life vinyl replicas of some of the most amazing creatures in the world. Excellent learning tool to introduce young children to our delicate and often endangered inhabitants of our planet. A fun way to spark the innate curiosity of a child. Each replica is finely hand painted and accurate down to the last detail. Educational information in five languages is included with each replica. All our products are phthalate-free and thoroughly safety tested to safeguard children's health. · Veterans and Newcomer Are Finalists in TDmonthly Charity Giveaway! Copyright © 2018 TDmonthly®, a division of TOYDIRECTORY.com®, Inc.